Are you fond of shopping online? Having a hard time searching for a gadget? Lazada Philippines is one of the premier online shopping store in the country. They have a wide variety of products such as gadgets, clothes, and other home appliances. It is a subsidiary of Rocket Internet and it was launched last April 2012. A lot of people nowadays want to have their own tablet. And there’s a brand new tablet that Lazada have in their online store right now is the new Haipad Anaconda Edition 7. 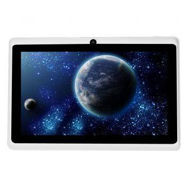 Haipad is a Chinese-brand of mobile tablets which has a competitive functions and has an affordable price. All of their products are manufactured in Shenzhen, China. New Haipad Anaconda Edition 7 available in Lazada. What makes this tablet stand out among other gadgets in the market today? Aside from the fact that you can surf the net, read e-books, play media files, video chat, and play multitudes of game apps, it also lightweight tab and 7″ multi touch screen. How to purchase this sleek, and affordable tablet? Register and log in at Lazada and search for Haipad Anaconda. The best thing in Lazada, it has a 1-year warranty and 7-day return policy, too.